In 2011, Yemen’s Arab Spring had threatened to push the country into a debilitating conflict. But remarkably, a deal brokered by the United Nations and the Gulf Cooperation Council prevented a bloody civil war. Longtime president Ali Abdullah Saleh stepped down; Hadi was tasked with overseeing peace talks and the creation of a new constitution. Today, no one is hopeful. The much-vaunted “Yemen model” for political transition, once mooted as a possible solution for Iraq, Libya and Syria, has been broken beyond repair. Sanaa is under the control of a militia made up of supporters of a onetime pariah rebel movement and of Saleh, who ruled north Yemen for 33 years before being ousted in 2011. Hadi has attempted to resign from the presidency while under effective house arrest — minutes after his prime minister and Cabinet quit their posts for good. Yemen’s restive south has effectively seceded from the north, and the economy is about to collapse. The vicious local al-Qaeda affiliate is resurgent. The surprise for those paying attention to Yemen is not so much that the transition has imploded — the odds were always stacked heavily against it — but the reason behind its collapse. In September 2014, the Houthis, a onetime religious revivalist movement-turned-well-organized armed group, began to seize control of the capital after several days of heavy fighting on the western edge of the city. Few Yemenis thought the group had the firepower or the gall to pull off a full-blooded assault on Sanaa. Most expected they’d soon pull back. But in the last four months, Houthi militias have become increasingly entrenched in Sanaa and across north and west Yemen. They achieved this by cooperating with their onetime nemesis, Saleh, to defeat the conservative Sunni faction that split from the Saleh regime in 2011. The alliance has come as a surprise. For years, Houthi supporters had blamed Saleh for the death of their founder, Hussein al-Houthi, in 2004. Now they were working alongside him. Will that alliance prove durable? The most recent crisis in Sanaa was driven by both sides’ opposition to clauses in a new draft constitution that lays out plans for a new federal model of government. But there are deep disagreements between the Houthis and Saleh about what Yemen’s future leadership should look like. Since Hadi announced his resignation, members of Yemen’s House of Representatives, a parliament dominated by Saleh’s General People’s Congress, have been mulling a vote that would allow Hadi to step down. GPC members have been calling for Yahia al-Rai, the speaker of the house and a hardline Saleh loyalist, to be made interim leader. The Houthis, however, have called for the formation of a military council led by their people. Ali al-Emad, a leading politburo member, has described the Yemeni parliament, elected in 2003, as “illegitimate”, arguing that it should have no say on the country’s future leadership. If Hadi’s resignation is accepted — and there is still a possibility that it will not be — the Houthis and Saleh will be set on a collision course. There is little trust between the country’s two remaining centers of hard power, and little that can be done to prevent a confrontation between them — Yemen’s military has quietly collapsed over the past four years. The sad fact is that the consensus reached at the peace talks in 2014 was little more than a mirage, a brief moment when Yemenis dared to dream that their differences could be settled through inclusive dialogue. Instead, they have again found themselves the losers in a high stakes, winner-takes-all game that they have no say in and that threatens to push the country over the edge for good. Generation of Long-Lasting Mideast Rulers Produced Stability—and a Mess; With Death of Saudi King Abdullah, Is It End of Era or End of Error? The death last week of Saudi Arabia’s King Abdullah means the Middle East is nearing the end of an extraordinary era of leadership, which goes a long way toward explaining why the region is in such turmoil and so plagued by extremism flaring to the surface. King Abdullah—whose memory President Barack Obama honors with a visit to the kingdom Tuesday—sat atop the Saudi government for a decade and effectively ruled for a decade before that, after his predecessor suffered a debilitating stroke. For 20 years, then, he was a reliable U.S. ally who used a combination of skillful maneuvering and an iron fist to keep his country calm and Islamic extremists mostly in check. All have left the scene in recent years. Now, one more member of this fraternity may be nearing the end of his own long period of one-man dominance. Sultan Qaboos of Oman, a strategically important if little-appreciated cog in the American regional security system, has ruled his land for 45 years but now is so ill that he has been undergoing unspecified medical treatment in Germany since last summer. Meanwhile, Kuwait’s 85-year-old ruler, Sheikh Sabah Al-Ahmad Al-Jaber Al-Sabah, the latest in a line of family members to rule his land, also is ill and recently underwent surgery. Most of these long-lasting rulers were friends of the U.S. Some—Jordan’s King Hussein, for example—were relatively benign. Others—Hafez al Assad, Saddam Hussein—were both unsavory thugs and largely hostile to America. But one thing they had in common is that they used their power and personal authority to quell unrest and the region’s tide of Islamic extremism. Sometimes some of them used a deft touch to co-opt and defuse dissidents. Most were simply and relentlessly ruthless in the task. In the process, they produced a long period of relative stability. Though observers often referred to the “volatile” Middle East in recent decades, these rulers, in fact, kept the volatility largely in check. By and large, that was beneficial to the U.S., with its endless thirst for a steady and reliable flow of oil from the region. What these rulers also did, though, was bottle up the growing political dissent and religious fervor in their lands, pushing those forces below ground, where they quietly built steam. Those of us who lived in the region at some point in the past few decades were well aware that these forces were bubbling; the rulers of the region made it hard to tell just how strong they were. Now we know, thanks to the spreading signs of Islamist sentiment. The downside of keeping a lid on a pot for a long time as it simmers is that pressure builds inside. The pressure-cooker analogy holds for the Middle East, and now the top has blown. So as remarkable as this generation of Middle East autocrats was for what it did to keep the lid on, these leaders’ legacies may lie more in what they failed to do. They failed to provide an outlet for dissent or a path for political reform. By suppressing Islamist tendencies and giving them no real outlet, they merely made the Islamist idea all the more tantalizing for a generation of young Muslims who have few other avenues for feeling empowered. In that sense, the late Saudi King Abdullah actually stood out as something of a reformer. He began, slowly, to open up the kingdom’s political system and to bring women into the mainstream of daily life. Ultimately his fear of internal threats slowed down the process, but at least it was begun. Elsewhere, others who could have opened the door to democracy instead attempted to build dynasties. Egypt’s Mr. Mubarak tried to pass power to his son; Syria’s Assad did so. In both cases, the result was disaster. The U.S. could have pressed Mr. Mubarak, in particular, harder to open the door to a peaceful and democratic transition. Instead, popular discontent in these lands built over years. Now there is little reason to think it will dissipate quickly. More likely, the era of relative stability under a generation of iron-fisted rulers has given way to a period of widespread ferment, the outcome of which is highly uncertain. WASHINGTON—The Justice Department has a special time reserved for thousands of immigrants awaiting their day in court: the day after Thanksgiving in 2019. In a fresh sign of the backlogs and delays pervasive in the U.S. immigration court system, the Justice Department has begun sending out notices to thousands of immigrants awaiting hearings that their cases will be pushed back nearly five years. The delay makes room for higher-priority cases caused last summer by a surge in unaccompanied minors and families crossing the border with Mexico. A precise figure for how many people will be given that far-off court date wasn’t immediately clear. But the number of people affected will easily be in the thousands, and could reach tens of thousands, according to people familiar with the decision. Immigration courts are unusual in that they are directly overseen by the Justice Department—meaning that, unlike federal or state courts, immigration judges are supervised and take instructions from administrative bosses. Lauren Alder Reid, spokeswoman for the Executive Office for Immigration Review, said the rescheduling of cases was the clear outcome of a decision made in the summer by the Obama administration to give priority to cases of unaccompanied minors, families and other urgent cases. Noonan: A Republic of Disrespect - America’s partisan divisions spread to international relations. Congress has the authority to do what it’s doing, but is it the responsible thing? Congress and the White House are supposed to work together on foreign affairs, as a matter not only of politesse but practicality. If this scenario becomes the norm—an angry Congress embarrassing or putting in a poor position a sitting American president—it would make America look to the world more torn and divided, more at the mercy of forces, more incapable and of course dysfunctional. Would that enhance America’s position or damage it? Transfers of benefits to individuals through social welfare programs have increased from less than 1 federal dollar in 4 (24 percent) in 1963 to almost 3 out of 5 (59 percent) in 2013. In that half-century, entitlement payments were, Eberstadt says, America’s “fastest growing source of personal income,” growing twice as fast as all other real per capita personal income. It is probable that this year a majority of Americans will seek and receive payments. This is not primarily because of Social Security and Medicare transfers to an aging population. Rather, the growth is overwhelmingly in means-tested entitlements. More than twice as many households receive “anti-poverty” benefits than receive Social Security or Medicare. Between 1983 and 2012, the population increased by almost 83 million — and people accepting means-tested benefits increased by 67 million. So, for every 100-person increase in the population there was an 80-person increase in the recipients of means-tested payments. Food stamp recipients increased from 19 million to 51 million — more than the combined populations of 24 states. What has changed? Not the portion of the estimated population below the poverty line (15.2 percent in 1983; 15 percent in 2012). Rather, poverty programs have become untethered from the official designation of poverty: In 2012, more than half the recipients were not classified as poor but accepted being treated as needy. Expanding dependency requires erasing Americans’ traditional distinction between the deserving and the undeserving poor. This distinction was rooted in this nation’s exceptional sense that poverty is not the unalterable accident of birth and is related to traditions of generosity arising from immigrant and settler experiences. Eberstadt’s essay, “American Exceptionalism and the Entitlement State,” argues that this state is extinguishing the former. America “arrived late to the 20th century’s entitlement party.” The welfare state’s European pedigree traces from post-1945 Britain, back through Sweden’s interwar “social democracy,” to Bismarck’s late-19th-century social insurance. European welfare states reflected European beliefs about poverty: Rigid class structures rooted in a feudal past meant meager opportunities for upward mobility based on merit. People were thought to be stuck in neediness through no fault of their own, and welfare states would reconcile people to intractable social structures. Eberstadt notes that the structure of U.S. government spending “has been completely overturned within living memory,” resulting in the “remolding of daily life for ordinary Americans under the shadow of the entitlement state.” In two generations, the American family budget has been recast: In 1963, entitlement transfers were less than $1 out of every $15; by 2012, they were more than $1 out of every $6. Causation works both ways between the rapid increase in family disintegration (from 1964 to 2012, the percentage of children born to unmarried women increased from 7 to 41) and the fact that, Eberstadt says, for many women, children and even working-age men, “the entitlement state is now the breadwinner of the household.” In the past 50 years, the fraction of civilian men ages 25 to 34 who were neither working nor looking for work approximately quadrupled. Eberstadt believes that the entitlement state poses “character challenges” because it powerfully promotes certain habits, including habits of mind. These include corruption. Since 1970, Americans have become healthier, work has become less physically stressful, the workplace has become safer — and claims from Social Security Disability Insurance have increased almost sixfold. Such claims (including fraudulent ones) are gateways to a plethora of other payments. RIYADH— King Abdullah bin Abdulaziz al Saud, who insulated Saudi Arabia from the Islamist and democratic forces roiling the Middle East in the name of stability, died early Friday at about age 90, the royal court said. Abdullah’s half-brother, Crown Prince Salman, who is 79 years old, was declared king and Prince Muqrin, 69, became crown prince, according to the statement read on state television. Born before his father founded the modern Saudi state in 1932, Abdullah focused his final years on internal and external security threats to a nation he had seen grow into an oil giant and center of political and religious power in the region. In one of his final statements, an address this month before the consultative Shoura Council read by his half-brother and heir to the throne, Abdullah emphasized that his country was “blessed with security and stability” in the heart of a volatile region. For Abdullah, who is widely believed to have run Saudi Arabia for the decade before his accession to the throne in 2005 following the death of his stroke-disabled brother King Fahd, stability was the paramount virtue. He abhorred the revolutions that brought religious fundamentalists to power in Iran in 1979 and unseated longtime fellow rulers in Egypt, Libya, and Tunisia three decades later. Abdullah was one of about 40 sons that Abdulaziz fathered by multiple wives, and with his death on Friday, he was immediately replaced by Salman bin Abdulaziz al Saud. Because of his age, the prospects for a long reign for the former crown prince are slight. The U.S. had an often fraught relationship with Abdullah in recent years, according to American and Arab officials. The late Saudi monarch was incensed by President Barack Obama ’s failure to follow through on his threats in 2013 to launch military strikes on the Syrian regime for its alleged use of chemical weapons. And Riyadh didn’t believe the White House showed strong enough support for Middle East allies, particularly in Egypt, after the Arab Spring revolts in 2010. Secret talks between the U.S. and Iran over its nuclear program also were viewed in Riyadh as a sign of a weakening U.S.-Saudi alliance and evidence that the White House was willing to work behind Abdullah’s back, according to Saudi officials. U.S. officials said they’ll seek to quickly work with Saudi Arabia’s new rulers to stanch the crises in the region, ranging from Yemen’s civil war to the Islamic State insurgency in Iraq and Syria. American officials have voiced concerns over whether the new monarch will be able to consolidate his power fast enough to respond to these regional threats. Abdullah saw the future of Saudi Arabia and America as linked, and declared himself a loyal ally of the U.S. As he sought to buttress the kingdom’s status as the standard-bearer of the world’s Sunni Muslims and the region’s Sunni monarchies, he shared U.S. reservations over the regional ambitions of Shiite Muslim Iran. Together with Washington, his government fought al Qaeda and its Saudi-born leader, Osama bin Laden , who was as determined to depose the House of Saud as he was to punish America for deploying “infidel” troops on Saudi soil. After the Sept. 11, 2001, attacks on New York and Washington, Saudi security forces all but eradicated the kingdom’s al Qaeda branch. Saudis have helped foil at least two new plots to bomb American airliners since 2010, according to U.S. and Saudi officials. U.S. Vice President Joe Biden will lead a U.S. presidential delegation to Saudi Arabia to pay final respects to Abdullah. In its defense of Sunni interests against what it viewed as Iranian and Shiite encroachment, Saudi Arabia led a Gulf military force into Bahrain in March 2011 to bolster the Sunni royal family there amid protests, some violent, by the island’s Shiite majority. One reason for the kingdom’s supply of arms and money to antigovernment rebels in Syria was Syrian President Bashar al-Assad ’s ties to Iran and to Hezbollah, the Tehran-allied Lebanese Shiite military and political movement. In recent years, the government has undertaken to reduce the size of the foreign work force that the country in its early years depended upon for its development. Immigrants, however, still make up more than 30% of the population, and Abdullah leaves behind a country still heavily reliant on cheap foreign labor to perform jobs most young Saudis, even unemployed ones, don’t want. PARIS—When the French president dispatched an aircraft carrier to the Persian Gulf last week, he used his speech to the troops to criticize the U.S.—for failing to launch timely military action in the Middle East. How the tables have turned since the “freedom fries” days, when France was taunted by some in the U.S. for its supposed cowardice and appeasement because it opposed the 2003 invasion of Iraq. In the Muslim world today, Paris is definitely a hawk. As President Barack Obama tried to extricate the U.S. from overseas wars in recent years, France pushed for Western intervention in Libya, launched a massive military operation against Islamist militants in Mali and neighboring lands, and stepped into a conflict between Muslim and Christian militias in the Central African Republic. It is also now flying bombing raids in Iraq as a key member of the U.S.-led coalition against Islamic State. All of this means that, alongside the U.S., France now looms atop the jihadists’ target list. In September, when Islamic State’s spokesman Abu Mohammad al-Adnani urged the militant group’s followers to kill troops and civilians in “infidel” domains, he singled out the “spiteful and filthy French” in particular. But, if jihadists calculated that this month’s Paris attacks, carried out by followers of al Qaeda and Islamic State, would frighten the French into withdrawing from the region, they appear to have miscalculated. French leaders have reacted by arguing that going after the terrorists in their own strongholds provides the best defense for the homeland. It remains an article of faith in the French foreign-policy establishment that the U.S.-led invasion of Iraq in 2003 was a major blunder that set off a disastrous chain reaction of Islamist radicalism across the region. But, in analyzing the causes of Islamic State’s rise and the peril of European terrorism it has spawned, French officials now place as much, if not more, blame on Mr. Obama’s decision in August 2013 not to launch military action in retaliation for suspected use of chemical weapons by the Syrian regime of Bashar al-Assad. Since then, Islamic State and al Qaeda-affiliated rebels have gained the upper hand in the Syrian conflict, marginalizing the more moderate rebel factions backed by the West. President François Hollande, who had been left blindsided by Mr. Obama’s last-minute decision to abort the planned airstrikes, returned to this sore point in his speech aboard the Charles de Gaulle aircraft carrier last week. Obama administration officials dispute the notion that they have pulled back from world trouble spots, arguing instead that they are using power in a smarter way. It was Mr. Hollande’s predecessor, the conservative former President Nicolas Sarkozy, who managed to heal the trans-Atlantic rift caused by the Iraq invasion. As the flood of weapons and militants from Libya destabilized neighboring African countries, in 2013 Mr. Hollande ordered military action to roll back the Islamist militias that seized northern Mali and threatened to overrun the rest of that country. While that intervention is widely viewed as a success, Islamist unrest still rumbles in the region, and France has to maintain 3,000 troops in Mali and nearby Mauritania, Burkina-Faso, Niger and Chad. Mr. Hollande has also stuck to Mr. Sarkozy’s hard line on Syria and Iran. “French diplomacy since Sarkozy is dominated by neo-cons, very close to the thinking of the Bush administration—and this is something that continued under Hollande,” says Jean d’Amécourt, a former director of strategic affairs at the French ministry of defense and former French ambassador to Afghanistan. Many French officials dispute this assessment—saying that France’s activism in the Middle East isn't so much the result of ideological shifts in Paris as a reaction to the whiplash caused by the U.S. going from Bush-era interventionism to what they see as the Obama administration’s neglect of the region. President Barack Obama will go before Congress Tuesday night to address the state of the union. He won’t be addressing the state of his Democratic Party directly, though it is interesting to think of what he might say were he to do so. The thought arises because it will be the first time Mr. Obama addresses a Congress under full control of the opposition Republican Party. That makes the tone of his remarks exceptionally important: Does he stress the (relatively few) areas where there is the potential for agreement, or lay down political markers by focusing on the areas where the two sides have little realistic chance of agreement? My fellow Democrats, we have much to be proud of and thankful for. We have won convincing victories in back-to-back presidential elections, and identified a potentially powerful presidential-election coalition that is relatively young and, if we play it right, can serve us well for years to come. The nation’s demographic trends seem to be moving in our direction. We have enacted a health-care overhaul that has brought coverage to millions and will be difficult or impossible for its opponents to uproot. We have used the power we enjoyed through having control of the White House and the Senate to confirm 303 district- and circuit-court judges in my first six years. And the economy finally may be engaged in a lasting rebound from the dark days of the financial crisis. At the same time, though, we should be worried. Worried because, while holding the White House is nice, there are real problems developing at the foundation of the party. Here in Congress, our power has slid steadily since I came into office. We started my administration with 57 Democrats and two independents who were on our side in the Senate. We’re now down to 44 Democrats and two friendly independents. If anything, our slide in the House has been more alarming. We began my administration with 257 House Democrats; we’re now down to 188. That’s the smallest contingent in the House since 1949. In large swaths of the center of the country, we are nearly shut out of the House. In 11 states, we have no House members at all. In politically key swing states, our House representation should be particularly worrisome. In Michigan, Republicans hold nine House seats while we have just five. In crucial Ohio, it is 12 Republicans and four Democrats. Some will argue that this is partly the result of Republicans’ control of state governments, which has allowed them to draw House districts to their favor. And that’s true. But you know what? Unless we start doing better out in the states, the source of our future national leaders, that isn’t going to change. We now hold just 18 of the nation’s 50 governorships. Across the land, Republicans control 68 state legislative chambers, and we have just 30. In lower houses of state legislatures, Republicans hold 3,039 seats; we have 2,342. I worry that the glitter and glory of holding the White House is masking these problems at our foundation, and allowing us to pay too little attention to them and what they mean for us. As any baseball team knows, winning a World Series this year doesn’t guarantee any future success if the minor-league system has fallen on hard times. And on the subject of the White House: Should it concern us that we have basically one major contender for the presidential nomination in 2016, while the Republicans have, depending on how you count them, perhaps a dozen? Our strength among Hispanics, African-Americans, Asian-Americans and young voters favors us in presidential-election years. But unless we again pair that with a viable coalition in congressional elections, we won’t be able to produce results—and the power of our presidential coalition could suffer in the long run as a result. So how do we make up lost ground? We remember this: We can’t give up on the broad middle of the country—geographically, economically or culturally. The Republicans’ great mistake has been their failure to figure out how to speak to Hispanics and young voters. We shouldn’t replicate the mistake when it comes to working-class middle America. The next cycle in politics belongs to the party that can devise, articulate and implement a solution to today’s fundamental economic mystery, which is why the economy is growing but leaving wages stagnant, the middle class stuck and inequality on the rise. If we’re thinking either about the state of the union, or the state of the party, that’s the burning question. The U.S. and Europe are facing an economic divergence not seen in nearly two decades. While the European Central Bank is considering a stimulus effort to fight deflation, U.S. officials are optimistic about America’s economy. We report that the Federal Reserve is on track to start raising short-term interest rates this year, despite investor worries about weak global growth, oil prices and slowing consumer-price inflation. By contrast, the ECB is widely expected to launch a controversial bond-buying program on Thursday, known as quantitative easing. The program would likely involve the purchase of hundreds of billions or more of euro-denominated government bonds. While the U.S., U.K. and Japanese central banks have used QE, the ECB faces many unknowns. We note that it has 19 different bond markets—from triple-A Germany to junk-rated Greece—and bond yields are near record lows, suggesting it will be difficult to steer them lower. German officials are strongly warning against the bank using the bond-purchase program as a form of fiscal union by the back door, insisting that the national-member banks within the ECB should buy their own governments’ bonds. All of this is likely to limit the effectiveness of QE, Europe-style. Nevertheless, European shares once again neared multiyear highs this morning, buoyed by expectations that the ECB will launch the stimulus program. After experiencing one of the most rapid economic ascents in history, China is slowing. Our story looks at how China’s growth rate fell to 7.4% in 2014, its lowest level in nearly 25 years, weighed down by falling real-estate sales, soaring debt and weak industrial production. The same factors are expected to erode its growth in 2015, and the International Monetary Fund forecast 6.8% growth for China next year. Slipping momentum in China weakens an already soft global economy and is projected to hit emerging markets the hardest. Commodities importers, on the other hand, might benefit as the price of shipments declines. Should growth fall precipitously, economists say Beijing could carry out deeper interest rate cuts, faster spending on infrastructure projects and reductions in the capital that banks must hold on reserve with the central bank. However, if pursued too aggressively, such measures could worsen overcapacity and pile up more debt. Chinese shares rose 1.8% on the news, a day after their largest one-day drop in more than six years following a crackdown by Chinese regulators on margin trading. 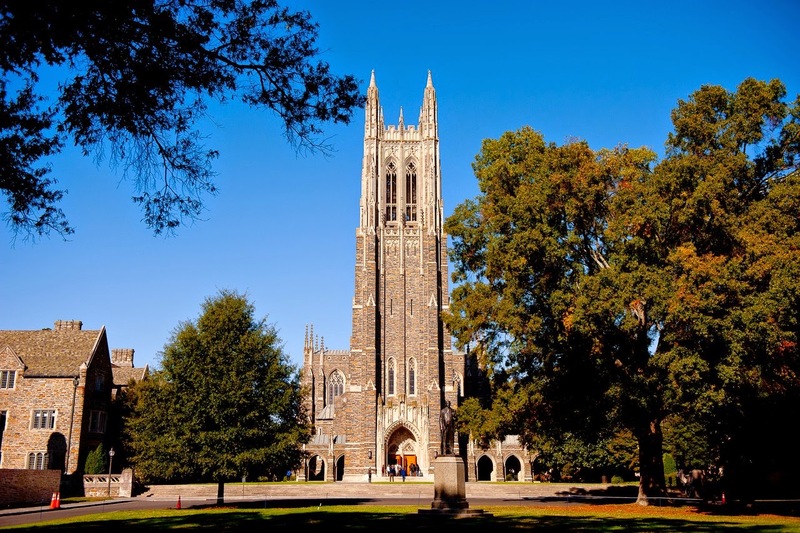 RALEIGH, N.C.—Duke University has canceled its plan to use the tower of its chapel for a weekly, amplified call to prayer for Muslims. In a release Thursday, the university said Muslims will instead gather on the quadrangle before heading into a room in the chapel for their weekly prayer service. Duke University canceled plans Thursday to begin a weekly Muslim call to prayer from the campus chapel this week, an initiative that had set off debate on social media. A school spokesman and a Duke Muslim leader said that a serious and credible security threat played a role in the decision. 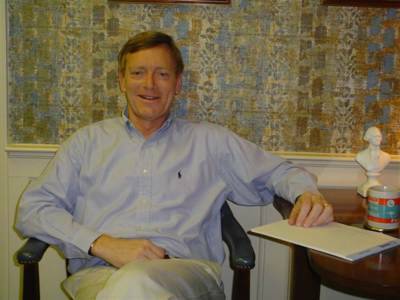 Michael Schoenfeld, vice president for public affairs and government relations, . . . said Thursday night that a “serious and credible” security threat was one of the reasons for the decision. University officials declined to elaborate. An estimated 184,000 immigrants are living illegally in the metro Atlanta area and 68,000 of them are eligible for relief under the Obama administration’s executive actions on immigration, according to report released Thursday. Gwinnett County is home to the largest population of immigrants without legal status at 71,000, according to the report by the Migration Policy Institute, a Washington-based think tank that evaluates migration policies. Gwinnett is followed by DeKalb County, 42,000; Fulton County, 37,000; and Cobb County, 34,000. The report also includes an estimate for Hall County at 16,000. In all, the report includes estimates for 94 counties nationwide. Three-quarters of France’s roughly half-million Jews are . . . of North African origin, Jewish community officials estimate. Their families moved to the safety of France mostly in the period between Israel’s creation in 1948 and Algeria’s independence in 1962, as persecution and discrimination emptied out the once-huge Jewish communities of former French possessions across the Mediterranean. In 2013, the last full year for which data have been compiled, there were 423 reported anti-Semitic incidents in France, compared with 82 in 1999, according to the Jewish Community Security Service, a joint body created by France’s main Jewish organizations that compiles data based on police reports. Much of the recent upsurge of anti-Semitic violence in France has occurred in rundown towns likes Sarcelles, a north Paris suburb where Jews of Algerian, Moroccan and Tunisian origin live alongside Muslim immigrants from the same countries. While feelings of fear and distress run through the French Jewish community after the Hyper Cacher attack, they are particularly strong among those of North African origin, with their memories of forced exodus still raw. Some 6,900 French Jews moved to Israel in 2014, up from 3,300 in 2013, according to the Jewish Agency for Israel, an Israeli organization that oversees the process. The number is expected to grow to 10,000 in 2015, the agency said. Many others are moving to Israel informally, or leaving France for the U.S., Britain and even Germany, Jewish community officials said. Israeli Prime Minister Benjamin Netanyahu, who met French Jewish community representatives over the weekend, said Israel is preparing for increased immigration of Jews from France and other countries he said have been hit by anti-Semitism. “I wish to tell all French and European Jews: Israel is your home,” he said in Paris. At the end of the 18th century, revolutionary France removed Medieval restrictions against its Jews and led the push to give equal rights to long-oppressed Jewish communities across the continent. Many of its Jews prided themselves on assimilating into the mainstream. A Jewish prime minister governed France in the years before the outbreak of World War II. About a quarter of France’s prewar Jewish population of around 300,000 perished in the Holocaust, killed by the Nazis and their French collaborators, according to Yad Vashem, the Holocaust memorial and research center in Jerusalem. Then, the numbers started growing again, thanks to the postwar influx from North Africa. These newcomers from North Africa were often more religious than France’s established Jewish communities, sparking a boom in the creation of Jewish schools, kosher restaurants and places of worship—turning France into the center of Jewish life in Europe. Over the past decade, however, the country’s Jews increasingly began feeling threats from a new direction—targeted by Muslim militants angered by Israel’s actions in the Middle East. Four years after the Arab Spring began, the new Middle East looks more and more like the old one—but worse. For decades, the bleak choice in the region was between dictators such as Egypt’s Hosni Mubarak and the Islamist militancy that they always invoked when pressured by the West to liberalize. The uprisings of 2011—often spurred by liberal and secular activists—produced fleeting hopes that the jihadists and autocrats would no longer be the only alternatives. But today, Egyptian President Abdel Fattah Al Sisi oversees a regime that is seen as more repressive than Mr. Mubarak’s in many ways. This new Egypt and its main financiers and allies—the absolute monarchies of Saudi Arabia and United Arab Emirates—increasingly project power and influence across the region. On the other side of the equation, Islamic State has seized a Britain-size chunk of Syria and Iraq, and now is spawning affiliates in Libya and Egypt’s restive Sinai Peninsula. It is outmatching al Qaeda of old in wanton barbarity and military prowess. Underscoring the growing terror threat to the West, al Qaeda’s offshoot in Yemen claimed responsibility for last week’s attack on a satirical magazine in Paris, while a French follower of Islamic State killed first a policewoman and then four hostages at a kosher grocery. In his three decades in power, Mr. Mubarak often told visiting American dignitaries that the choice was between him and the Muslim Brotherhood, the country’s main Islamist organization with branches across the region. He did prove right: A year after his ouster, the country’s first democratic presidential elections put the Brotherhood’s Mohammed Morsi in power. The Brotherhood under Mr. Morsi alienated many Egyptians by clamping down on dissent, excluding other political movements, and imposing its religious agenda. Another year later, liberals who once joined hands with Brotherhood supporters in Cairo’s Tahrir Square chose a dictatorship that would preserve secular freedoms over a democratically elected Islamist government. Their mass protests egged the army on to end the country’s democratic experiment, putting Mr. Sisi in power and enabling the current crackdown. Egypt’s new authorities have since imprisoned tens of thousands of political foes and imposed new restrictions on protesting, the media, nongovernmental organizations and human-rights groups. Elsewhere in the region, an outright Saudi military intervention choked the Arab Spring in Bahrain. And in still-democratic Tunisia, the only relative bright spot, voters in December elected as president the 88-year-old former speaker of the ousted dictatorship’s rubber-stamp parliament. He promptly named another senior former regime figure as prime minister. Chastened by the Egyptian example and fearing a similar fate, Tunisia’s main Islamist party, Ennahda, didn’t even field a presidential candidate. Egypt suffered relatively minor violence by the bloody standards of the recent four years, avoiding the horrors of the Syrian and Libyan civil wars. It is those horrors, which fill the screens of Arab TV channels every day, that make increasingly appealing the Arab rulers’ old mantra of “istiqrar” or stability, at all costs. Championing this mantra are some of the least democratic countries in the region—Saudi Arabia and the U.A.E. “The Arab Spring represented change, and the monarchies do not like change,” explained Jamal Khashoggi, a prominent Saudi analyst who manages a new regional TV network, Al Arab News. After emerging unscathed from the region’s revolutionary upheaval and squeezing out dissent at home, the Saudis and Emiratis now are driving a regional campaign to stifle whatever has remained of the Arab Spring’s hopes of establishing democratic, accountable governments, critics say. The key question is whether this restoration in the Arab world is transient—to be upended by even more dramatic cataclysms in the coming years—or represents the new normal. Frederic Wehrey, a senior associate at the Carnegie Endowment for International Peace, coined the term “Saudi Thermidor” to describe the current “reactionary period in Arab uprisings.” He argued in a recent article that the counterrevolutionary drive in the region is unsustainable and would ultimately collapse, just as it happened with the Thermidor conservative backlash against the excesses of French Revolution. BAGHDAD—The U.S.-led coalition against Islamic State is coming under growing criticism in Iraq, complicating the mission as Washington ramps up its forces in the country. Many Iraqis initially welcomed the foreign help last summer as the militant group swept through the north and pushed toward the capital. Islamic State has lost momentum since then as airstrikes helped Iraqi and Kurdish forces regain key cities. But now, more Iraqis are criticizing the U.S.-led campaign—especially the effort to rebuild Iraq’s military—as too slow and too small. The swelling disapproval reflects Iraqi impatience at the U.S.-led mission’s multiyear strategy against Islamic State, also known as ISIS. Many Iraqis see the insurgents as an immediate threat pulling their country apart amid immense suffering. Some Iraqis even believe the coalition is aiding the extremists by airdropping weapons into the third of the country they control. The public criticism highlights the challenge the U.S. faces in explaining the mission to the country’s divergent, often rival, Shiite, Sunni, and Kurdish communities—each jostling for its own favored outcome. Iraqi officials have stepped up their public criticism of the campaign, drawing lively interest in the Iraqi press. Prime Minister Haidar al-Abadi said this week that the coalition was moving too slowly to build up the army. The U.S. military, which is leading a 12-country mission to train Iraqi forces after units melted away last year, is saddled with the troubled legacy of its 2003 invasion and toppling of Saddam Hussein. The last U.S. troops from that war withdrew from Iraq in 2011. About 2,200 U.S. trainers and advisers are now in Iraq, a number that could grow to 3,100 under an expanded mission announced by President Barack Obama in November. The rising public frustrations with the campaign are fueled by political posturing over what the coalition should be doing. 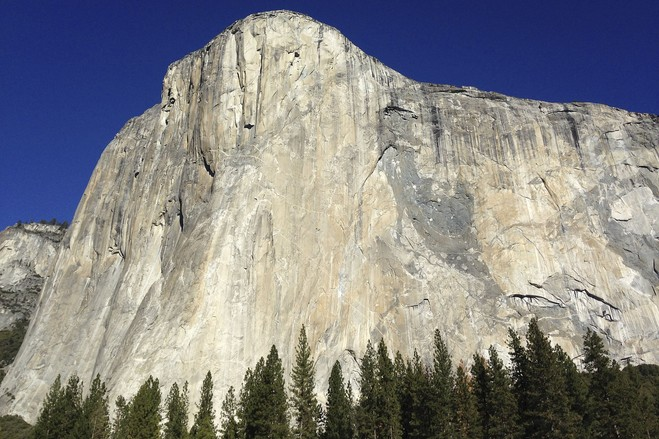 El Capitan. How I do love Yosemiti National Park - God Bless America! A surge of oil from outside of the Middle East flooded global energy markets. The world-wide thirst for crude didn’t keep up. The Organization of the Petroleum Exporting Countries stood by and watched as oil prices fell and then fell more. Welcome to the world of oil in 2015—a repeat in surprising ways of the story 30 years ago. Between November 1985 and March 1986, the price of crude plunged by 67%. Between June 2014 and today, crude prices have fallen by 57% and could well head lower. After the mid-1980s bust, it took nearly two decades for oil prices to rebound to pre-bust levels and remain there. Energy executives are now haunted by the question: Will it take as long this time? The answer may lie in one enormous difference between today and 30 years ago: the speed of shale. Before U.S. energy companies figured out how to pull oil from shale formations, petroleum projects often took years to execute. Two decades passed between a fisherman spotting a colorful slick floating off the coast of Mexico and oil flowing from the giant Cantarell project off the Yucatan Peninsula. It took nine years and billions of dollars to get crude moving from the North Slope of Alaska to markets. Today, the discovery and development of oil from shale rocks means that oil output is faster paced and near at hand—in Texas and North Dakota, Colorado, Oklahoma, Wyoming, even Ohio. Drilling and hydraulically fracturing a well takes weeks, not years. An expensive well costs $10 million, compared with the billions needed to drill offshore wells and build associated infrastructure. Moreover, expenditure of both time and money are falling fast. 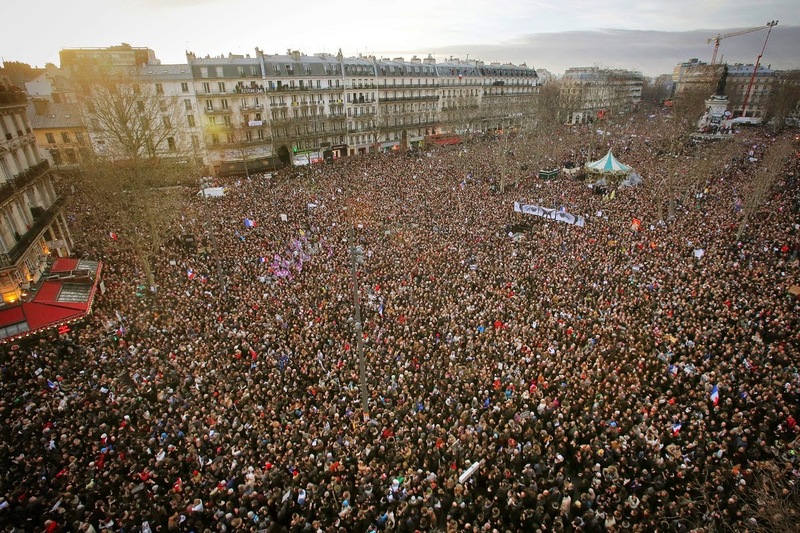 Thousands gather in Paris on Sunday for a march against terrorism, an event that was attended by many world leaders. WASHINGTON—President Barack Obama regrets his decision not to send a top White House official to represent the U.S. at a march in Paris that drew dozens of world leaders in a show of solidarity against terrorism, press secretary Josh Earnest said. The response to criticism that neither Mr. Obama nor Vice President Joe Biden attended the event Sunday was a rare public admission of a mistake by the White House. The highest-ranking U.S. official at the march was the American ambassador to France, Jane Hartley. Mr. Obama didn’t make that decision, Mr. Earnest said, adding that no one at the White House brought such a request to the president’s attention. The White House cited security concerns with the president or vice president attending the outdoor event. Mr. Earnest noted that the march was planned in just 36 hours. Still, the White House agreed with critics from both parties who have said the decision marked a missed opportunity. The U.S. Secret Service wasn’t notified by the White House of a potential trip to Paris. Agency officials said protecting the president or vice president at the march would have been a challenge, but their logistic and security operations would have been able to develop an effective plan. UPDATE in the form of an article from The Wall Street Journal entitled Obama, Biden Absent From Paris Solidarity March. WASHINGTON—There were two notable exceptions as world leaders gathered in Paris on Sunday in an emotional show of solidarity following the terrorist attacks in the French capital. Neither President Barack Obama nor Vice President Joe Biden attended the events, and their absence drew criticism. The White House sent Attorney General Eric Holder to Paris, along with a top official at the Department of Homeland Security, for meetings with French officials in recent days. But the administration chose not to have the president or vice president represent the U.S. during Sunday’s events, which drew more than 40 world leaders and millions of demonstrators in the streets of Paris. While assorted leaders were front and center during public events in Paris on Sunday, the Justice Department said Mr. Holder attended a ministerial summit on counterterrorism and a second meeting with world leaders hosted by French President François Hollande. 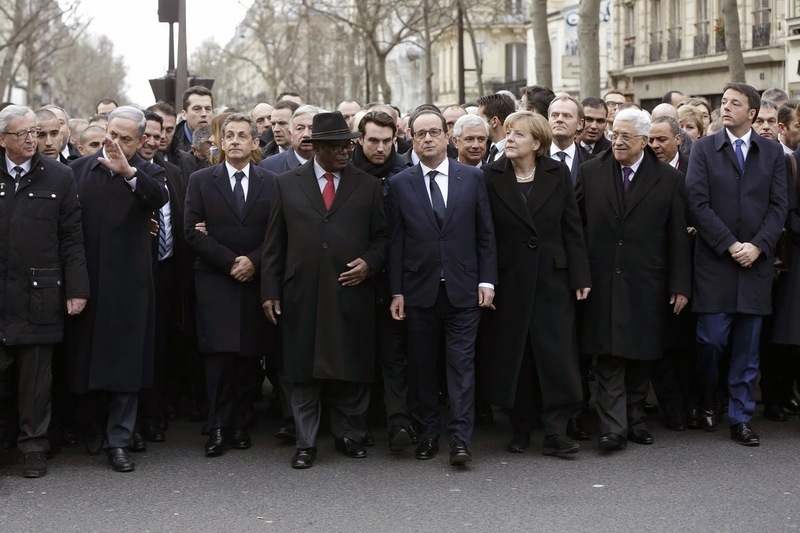 But no U.S. official was a fixture in the day’s memorable moment featuring Israeli, Palestinian, French and German leaders linking arms as they marched in defiance of the terrorism threat. The highest-ranking American official at the march was the ambassador to France. As recently as Friday, Mr. Obama said France is America’s oldest ally and pledged to offer any needed assistance. He also spoke on the phone with Mr. Hollande and visited the French Embassy in Washington last week. Victoria Nuland, an assistant secretary of State, attended a march in Washington. Neither Messrs. Obama nor Biden had public events scheduled on Sunday. Mr. Obama was at the White House, while Mr. Biden was at his home in Delaware, according to his public schedule. For many oil-exporting countries, though, the more important price is the one it takes to cover swollen public budgets. In the wake of the Arab Spring, this isn’t just an economic consideration. So while in strictly operational terms it might cost less than $20 a barrel to extract oil in Saudi Arabia, the “fiscal break-even” price is estimated to be around $90 to $100. But that is only half the equation. The other half is volume: If you are getting less money per barrel, one way of trying to cover your costs is to produce more barrels, if you can. There is a trade-off because the more barrels on the market, the lower oil prices go—at least until some producers needing even higher prices are forced out. The U.S. shale boom’s potential Achilles’ heel is its reliance on easy credit. Crashing oil prices would both cut the cash flows needed to pay interest costs and reduce the value of reserves that exploration and production firms use as collateral for new loans. A rapid drop in price also would complicate the E&P industry’s ability to adapt via redeployment of resources to more productive fields or selling assets to better-capitalized oil majors. Saudi Arabia appears to have gone for the nuclear option in maintaining its output. But maybe you ain’t seen nothing yet. When I Questioned the History of Muhammad - British scholar Tom Holland found himself in a firestorm—and under threat—when he raised doubts about the traditional account of the origins of Islam. I had always admired such boldness, but I was far too pusillanimous to imagine that I might ever find myself similarly exposed. I was a historian, not a satirist—and, what’s more, a historian of classical antiquity. How could a book on ancient Rome offend anyone? The answer only gradually began to dawn on me when I came to write not about Rome’s heyday but about her fall. By the 6th century A.D., the Roman Empire had been dismembered. The western half, including Italy itself, was ruled by barbarians; only the eastern half survived. In the early 7th century, that remnant was reduced, in turn, to a bleeding trunk. Provinces that had been Roman for centuries were lost for good to a new breed of imperialists: the Arabs. How had this happened? The fall of the Roman Empire in the East seemed to me a fascinating, decisive and curiously under-discussed topic. In 2007, without really weighing up the likely consequences, I decided to make it the theme of my next book. Fools rush in where angels fear to tread. The collapse of Roman power in the Near East was the flip side of another story: the rise of Islam. The Arab armies who seized from the Romans the provinces of Palestine, Syria and Egypt were Muslim, according to traditional historiography, and had been inspired to their remarkable feats of conquest by the revelations of a prophet, Muhammad. It took me only a cursory immersion in the scholarship of the period to realize that these presumptions were (to put it mildly) widely contested. Indeed, it was hard to think of another field of history where quite so much was up for grabs. Questions fundamental to Islam’s traditional understanding of itself turned out to defy consensus. Might the Arab conquerors not actually have been Muslim at all? Did the Quran, the supposed corpus of Muhammad’s revelations, in fact derive from a whole multiplicity of pre-existing sources? Was it possible that Muhammad himself, rather than coming from Mecca, had lived far to the north, in the deserts beyond Roman Palestine? The answer to all these questions, I gradually came to conclude, was yes. For the first time, I found that writing a book about ancient history was giving me sleepless nights. That, though, was nothing compared with the nervousness I felt after receiving a second commission: to make a film about the origins of Islam. It came from Channel 4, a TV station that had been set up in the U.K. back in the 1980s with a publicly funded remit to serve as the BBC’s naughty younger brother. Ever since, no Christmas or Easter has been complete in Britain without a documentary in its schedule questioning the historicity of the Bible. Never before, though, had it—or, indeed, any other British TV channel—aired a documentary questioning the basis of what most Muslims believed about the origins of their faith. I still remember a feeling of almost physical panic as I stood on the battlements of an abandoned Roman city in the Negev Desert and raised the possibility, on camera, that Muhammad might not have come to Mecca. The director, the brilliant and award-winning filmmaker Kevin Sim, had aimed to make me and my anxieties about what I was doing a part of the film, and he more than succeeded. There is barely a shot in the documentary in which I do not look mildly terrified. Nevertheless, by the time the program finally aired in late August 2012, I had come to feel more sanguine about its prospects. My book had come out four months before, and I was still alive. Reviews had been mixed, which was no surprise considering how controversial the subject matter was: Some were adulatory, some vituperative. Muslim critics, without exception, had hated it. None, though, to my relief, had disputed my right to subject the origins of Islam to historical inquiry and to publish my conclusions. For that reason, as I looked ahead to the airing of the documentary, I felt tolerably confident that no one would get too upset. It didn’t take long for me to realize my mistake. Just a few minutes into the broadcast, my Twitter stream was going up in smoke. By the time the show ended, the death threats were coming in thick and fast—and not just against me but against my family as well. Channel 4 was also deluged with protests. A private screening scheduled for assorted movers and shakers had to be canceled after the police warned that they couldn’t guarantee the security of those attending the event. Because many of the invitees had been journalists, this naturally gave the controversy a new lease of life. Two weeks later, I was still fielding death threats from Muslims convinced that the only plausible explanation for my having made the film was that I was in the pay of Mossad or the CIA or both. The most chilling moment of all came when Press TV, a propaganda arm of the Iranian government, aired a documentary leveling pretty much that accusation. It was the one time that I seriously imagined I might end up as the new Salman Rushdie. Gradually, though, the protests faded away, as storm clouds of outrage tend to do. My wife and children put away the emergency call devices given to them by the police, and we all breathed a collective sigh of relief. Over the succeeding months, I was invited to address various public meetings hosted by Muslim organizations, and the attendees, though rarely enthusiastic about my arguments, gave me a perfectly amicable hearing. At a conference organized by Oxford University to discuss my book and film, I was asked what lessons I had learned. The chief one, I answered, was that the freedom to write history without intimidation was no longer something that I took for granted. But I also had learned that it was possible, when my work came under attack, to defend it and live to tell the tale. I have not changed my mind. Just as the staff of Charlie Hebdo were willing to die in defense of what they saw as the legacy of Diderot, so should historians be conscious of what is at stake in defense of the legacy of Gibbon. Compared with satirists and polemicists, we stand a good way back from the front line, but none of us should be in any doubt that we are in the same fight. —Mr. Holland is the author of “Rubicon: The Last Years of the Roman Republic” and “In the Shadow of the Sword: The Birth of Islam and the Rise of the Global Arab Empire.” His new translation of “The Histories” of Herodotus is published by Penguin Classics. His documentary, “Islam: The Untold Story,” is available online in the U.K.
Europe’s ascendant anti-immigration and nationalist movements tried to capitalize on a deadly attack in Paris this week to trumpet a theme they have pressed for years, but rarely before with this much urgency: a loss of cultural identity. “This bloodshed shows that anyone who ignored or laughed off the concerns about the threat Islamism poses is a fool,” said Alexander Gauland, a leader of Alternative for Germany, an upstart party that wants to limit immigration and take Germany out of the euro. In the past, such rhetoric would be quickly dismissed as the ramblings of the political fringe. But these parties, from France to the Netherlands to the U.K., have been on the march in recent years, fueled by growing public discontent over a sense among many Europeans that their traditional way of life is threatened. Europe’s persistent economic woes and the growing—and oft-resented—influence of the European Union in national affairs have provided an opening to these movements, which critics say prey on their citizens’ basest fears. These groups have long targeted Islam, whose growing presence on the continent they say threatens Europe’s cultural mores. The radicalization of a generation of dispossessed Muslims in Middle Eastern wars in Iraq and Syria has only deepened fears, helping these parties to score their best showing ever in May’s European Parliamentary vote. “Western governments have to realize that we are at war,” said Geert Wilders, the leader of the Netherlands’ Party for Freedom. Europe’s establishment parties worry that the attack provides the nationalists more ammunition to sow xenophobia. Those tensions bubbled to the surface in France on Thursday. Fears of terror were on the rise even before the Wednesday attack on the French magazine Charlie Hebdo that killed 12 people. A new survey of 1,005 people by polling company Ifop showed 80% of French people thought there was a high terrorist threat in France, the highest ever since the poll began after the Sept. 11 attacks in the U.S. in 2001. The attack in France on Wednesday came at a particularly sensitive moment for Germany, where growing weekly anti-Islam demonstrations in the eastern city of Dresden have roiled the nation over the past month. The Bertelsmann Stiftung, a German foundation, found that the share of non-Muslim Germans who viewed Islam as incompatible with the Western world rose to 61% in November 2014 from 52% in 2012. WASHINGTON—The Obama administration publicly called on Saudi Arabia to rescind its sentencing of a political activist that includes the punishment of 1,000 lashes. The unusual diplomatic rebuke is expected to further strain Washington’s relations with the Arab monarchy at a time of serious disagreements over strategic and economic policies. The State Department regularly calls on foreign governments to respect human rights and to observe due process of law when confronting political opponents. But senior U.S. officials said Thursday it is extremely rare for Washington to demand the reversal of a legal decision, particularly by an important U.S. ally. Current and former U.S. officials said the sharp rebuke against Saudi Arabia seems to highlight the changing nature of the alliance. In Sweden, where there have been three recent attacks on mosques, the anti-immigrant, anti-Islamist Sweden Democrats Party has been getting about 15 percent support in recent public opinion polls. The newspaper, Charlie Hebdo, in its raucous, vulgar and sometimes commercially driven effort to offend every Islamic piety, including the figure of the Prophet Muhammad, became a symbol of an aggressive French secularism that saw its truest enemy in the rise of conservative Islam in France, which is estimated to have the largest Muslim population in Europe. On Wednesday, Islamic radicals struck back. “This secular atheism is an act of war in this context,” said Andrew Hussey, a Paris-based professor of postcolonial studies. Professor Hussey is the author of “The French Intifada,” which describes the tangled relations between France and its Muslims, still marked by colonialism and the Algerian war. “Politically, the official left in France has been in denial of the conflict between France and the Arab world,” Professor Hussey said. “But the French in general sense it.”The attack left some Muslims fearing a backlash. “Some people when they think terrorism, think Muslims,” said Arnaud N’Goma, 26, as he took a cigarette break outside the bank where he works. With each terrorist attack, however, the acceptability of anti-immigrant policies seems to reach deeper into the mainstream. In Britain, for example, which also has a large Muslim population, the U.K. Independence Party has called for a British exit from the European Union and sharp controls on immigration, emphasizing what it sees as dangers to British values and identity. The mainstream parties have competed in promising more controls on immigration, too. Nowhere in Europe are the tensions greater than in constitutionally secular France, with as many as six million Muslims, a painful colonial history in Algeria, Syria and North Africa, and a militarily bold foreign policy. That history has been aggravated by a period of governmental and economic weakness, when France seems incapable of serious structural, social and economic reform. The mood of failure and paralysis is widespread in France. The Charlie Hebdo attack came on the publication day of a contentious new novel, “Submission,” by Michel Houellebecq, which describes the victory of Islam in France and the gradual collaboration of the society with its new rulers from within. Mr. Houellebecq, like the well-known caricaturists and editors who were killed at Charlie Hebdo, has been a symbol of French artistic liberty and license, and his publishers, Flammarion, were reported to be concerned that he and they could be another target. But the atmosphere has been heightened by the rise of the National Front and its leader, Marine Le Pen, who runs ahead of the Socialist Party in the polls, campaigning on the threat Islam poses to French values and nationhood. There was much recent attention to another best-selling book by a conservative social critic, Éric Zemmour, called “The French Suicide,” attacking the left and the state for being powerless to defend France against Americanization, globalization, immigration and, of course, Islam. Another new novel, by another well-known French writer, Jean Rolin, called “The Events,” envisions a broken France policed by a United Nations peacekeeping force after a civil war. After a series of three apparently lone-wolf attacks on crowds around Christmas in France, and other attacks in Ottawa and in Sydney, Australia, there was speculation that this attack might also be a response to the September call of a spokesman of the Islamic State, Abu Muhammad al-Adnani, for supporters to strike at domestic targets of the countries attacking the Islamic State. Mr. Grand noted that at least 2,000 young French citizens have traveled to fight with the militants in Iraq and Syria. “So how do we manage our Muslim population?” he asked. “This kind of attack is very difficult to detect or prevent,” he said, adding that the state must not overreact, which is what the radicals want. François Heisbourg, a defense analyst and special adviser to the Foundation for Strategic Research, in Paris, said that the professional military acumen of the attack reminded him of the commandos who invaded Mumbai, India, in July 2011. “This is much closer to a military operation than anything we’ve experienced in France, and that may limit the political impact,” he said.